Another week, another blog post? Well yes! As promised I’m bringing you some vegan keto friendly recipes this week that I have tried out during my Keto time so far and have come to like. It took me a while to adjust to this change in my diet, but as they say: everything becomes a habit after 21 days. So it also worked for me. After 5 weeks of Keto I feel very much adjusted to this low-carb alternative diet and don’t even feel the need to eat a huge plate or pasta. My skin has also become much better since I have not been eating any refined sugar and hardly any fruit sugar. My vitamins I am still getting as every morning I eat 50g frozen berries within my breakfast and I am also eating plenty of greens such as kale, spinach,rocket salad and watercress. The keto diet also helped me regulate my portion size. As previously mentioned in my last blog post, I have been counting my calories since the beginning,which might sound tedious, but it actually helped me to get a better understanding for correct portion size without over or under eating. It also made me realise calorie relations between different foods and helped me prioritize what I want to eat to feel properly satisfied without going over my macros. But well, enough keto talk – how about some recipes now?! Within my first week of keto I tried to stick to savoury breakfasts, thinking that anything even remotely sweet would have too many fruit sugars and therefore a high carb content. After researching on day 7 I realised that I had been way more strict with the car vs than I needed to be and that I actually only should count net carbs (see my last blog post for more information about net carbs). Berries such as strawberries and raspberries are very low in carbs and actually fit perfectly into a keto diet, when consumed in small amounts. As a sweet-breakfast loving person my pre-keto breakfast mainly consisted of cereal, porridge, granola and other toppings – so switching to savoury morning meals turned out to be rather difficult for me. I also was absolutely over tofu scramble after day 6! I therefore decided to consume the main part of my carbs for breakfast and keeping the carbs for the rest of my daily meals at a minimum. 1. Add the frozen berries, cinnamon and Stevia to a large container and add the yogurt on top. 2. Using a stick blender combine all ingredients. I figured a stick blender works best for me as it is quite a small amount for a regular blender size. 3. 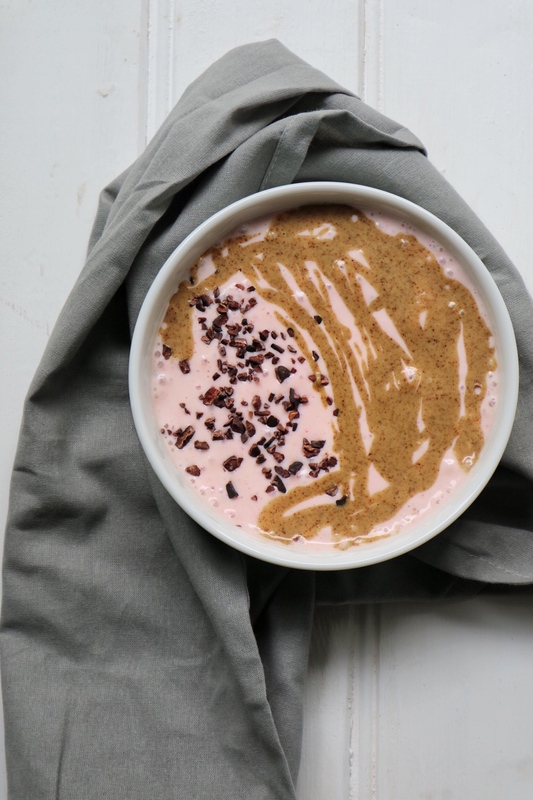 Add to a bowl, top with the almond & coconut butter and cacao and voila: breakfast is served! This cracker version is high in fats, and mainly consisting of soy flour, seeds and oils. 2. Combine everything, then form into small balls. A classic! And super-tasty on top. What more can you ask for? 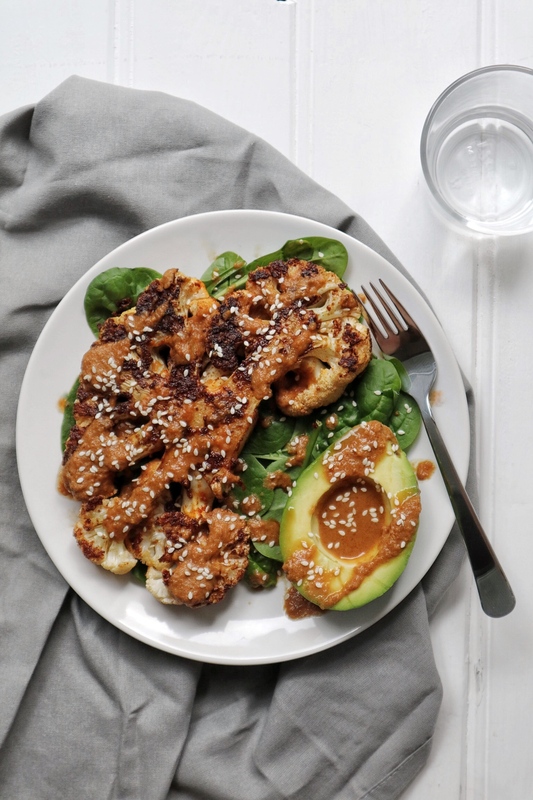 Create a light marinade for the cauliflower using soy sauce, liquid smoke and pepper. Add the steak to a shallow dish to rest it in the marinade for at least 30 minutes. Once the time has elapsed, roll the steak in the peanut flour, then fry the steak in some olive oil, until browning on both sides. To create the sauce combine peanut butter, soy sauce, (optional: hot sauce), salt, pepper, ginger powder, lemon juice and a little water with a whisk. Add the water slowly to this mixture whilst whisking and ensure that the sauce remains thick and does not become to watery. Adjust water amount accordingly. Drizzle the peanut sauce across your steak and top with sesame seeds for a little healthy extra fats and a crunch. Enjoy! Perfect if you’ve either just created a cauliflower steak the day before, or if you simply want to create an easy filling lunch time dish. Cut the cauliflower into small florets, then steam over boiling water for about 10-15 minutes or until softening. Add 2-3 florets at a time to a food processor and pulse until the consistency resembled a flaky rice. Remove the cauliflower rice from the blender before adding the next florets. In a large pan heat some olive oil and add a pinch of garlic powder. Prepare the vegan egg according to packaging instructions and add to the hot pan. Immediately start to scramble. After 5 minutes scrambling/cooking time, add your cauliflower rice and keep scrambling the pan mixture until the vegan egg has firmed. Add salt, pepper and paprika powder to taste. If you like it tangy, add a good splash of Sriracha! Want more keto-friendly recipes? 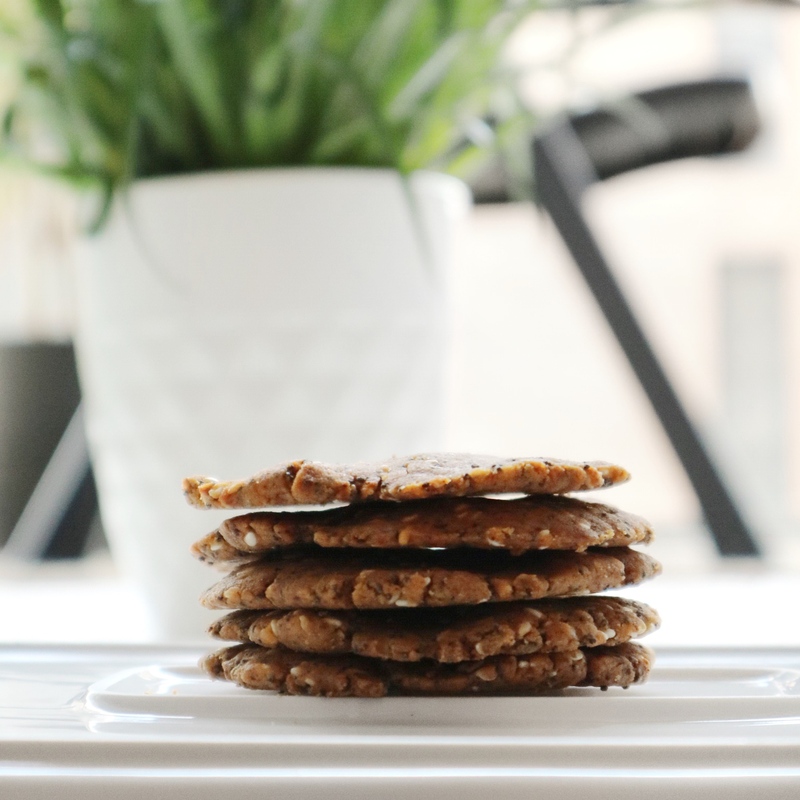 Let me know in the comments section below – I’ll happily share some more vegan keto recipe creations! Previous Post Another month, another chapter: What the Keto? !